On January 2018, I lost the only source of income that I had. I knew in my head it was a long time coming, but I was still surprised with the way the news was delivered to me. Closing a business in the Philippines was such a hassle, having to deal with government units and experiencing the slow and dreadful process of it all. At the same time, dealing with it cost time and money, too. It was a heartbreak, accepting the fact that I made plans that aren’t just meant to work out. However, I took that as a sign of freedom, it’s as if shackles were removed from my wounded and aching feet. For the second time in my life, I knew it’s time to burn bridges. That same month, my mother-in-law gifted us a roundtrip ticket with a destination of our choice. 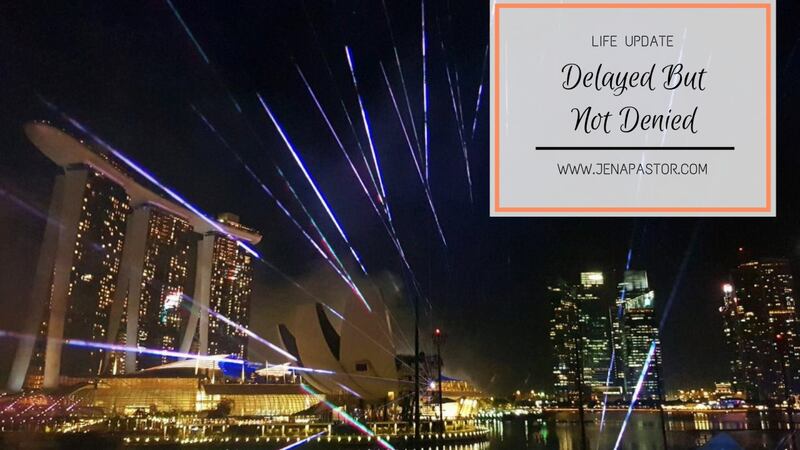 My husband and I picked Singapore, for the reason that we were there on July 2017 trying our luck to find work, that we didn’t have any time just be to tourists during our stay. We booked our flights for April 2018 just to travel. By February 2018, I got two job offers: one in Makati and one in BGC. It was a total surprise to me because it had been about 5 years since the last time I went into a job interview in Manila... and two years since the last time I was in the digital industry. I must say I actually enjoyed getting interviewed and being given exams because it made me realize I still knew something about the industry I left two years ago. In short, I accepted the job in Makati because of the niche of the work I’ve learned to love, and the comfort that Makati brings, as I considered it my second home. Beginning March, I went back to the corporate world. Despite the old and rickety building of Burgundy Tower (and the queue to the elevator that wasted a surmountable amount of time), I couldn’t have asked for a better boss, team, and colleagues. Everyone was working as part of the team and I found genuine people as well, as if we’ve known each other for a very long time. A week before our flight to Singapore, I got a message from a friend if I was still interested for a work opportunity in Singapore. Not expecting anything, susubukan lang kasi wala namang mawawala, I accepted the job interview. And the rest is history. During the times when I had the lowest self-esteem, I felt like God used a few people who pushed me back on the right track: a former colleague, a former manager, a new boss, a much newer boss, my mother, my mother-in-law – all of them were human channels who changed my life for the better. And if they are reading this, I want to thank them for believing in me when I naturally doubt myself. So my move to Singapore happened in June 2018. I was accompanied by my mother, sister, and husband. It was more nerve-wracking than exciting at first, worried for what might actually happen during the first time that I’d be alone: in a foreign land. When I think about my first month here on my own, I remembered chewing my IKEA-bought hotdog sandwich while tears were streaming down my cheeks. I probably looked so hilarious at that moment! Then again, a whole month of just being with myself developed character, patience, and perseverance. As a person who does not welcome change with open arms, I found myself again in the new things, places, and experiences I had to go through. For instance when I was just starting here, I never rode the bus in Singapore without my husband because I could easily get lost in spite of having Google maps at hand. However, I had no choice but to do this myself when I was on my own. And although the first time I rode the bus on my own meant missing my stop, the next ones felt like tiny accomplishments I never thought I can do alone. I cried almost daily during my first month, with all the adjustment, work challenges, and homesickness. I talked to my husband and friends, and I devour Menudo everytime I miss home. Eventually, I learned to like the new things around me. In no time, Laksa became my comfort food, and I discovered a lunch of Tom Yum for the entire week helped cure colds. I forgot I needed to cut down on rice whenever Bak Kut Teh was served, and I’m lucky to have no seafood allergy because I always crave for Prawn Noodles. I learned to order Yong Tau Foo despite the language barrier just by observing, and the acquired taste of Mala Hot Pot made me crave for more of this spicy dish almost weekly. Best of all, my husband and I shared a new regular date place where we enjoy good Steamboat when we just want to spend time with each other without having to spend much. From July to December 2018, my husband went back and forth to Singapore to visit me. It was difficult, not only in terms of finances but also with the uncertainty of us being physically together in one place. It was always painful when his visit comes to a close. And no matter what time of day he needs to fly home, I always end up weeping back in our rented room. Through all those months, I was and still am thankful to have a support system here through long-time friends and housemates-turned-family. After 6 months of waiting, our prayers were answered. On December 26, we received the good news. Long distance relationship, no more. On a different note, I’ve set my travel goal to visit at least two new countries every year. Although it didn’t happen in 2018, I was still able to travel abroad in my favorite destinations: Tokyo, California, Seoul, and Guam. In a span of 6 months, I went home three times and enjoyed the beach in Davao. I was reminded of how fun and enjoyable it is to travel within the Philippines, that my first travel of 2019 will be back in the beach waves of home. And even if I felt I traveled less in 2018 than the previous years, I ticked off a major item in my bucket list. And that is to work and live abroad at least once in my life. I kind of found a piece of me along the way – the independent Iska 11 years ago, who was once ecstatic figuring things on her own in the massive land of the university. 2018 may not have started positively, but it ended the best. Relationships were broken, but it's gradually being rebuilt over time. A door may have closed, but God opened several windows, smashed the roof, and poured in blessings after blessings. The answered prayers were delayed - but they weren’t denied. I know for sure, 2019 will be better. If you're reading this, I pray you don't lose hope, whatever battle you're going through.